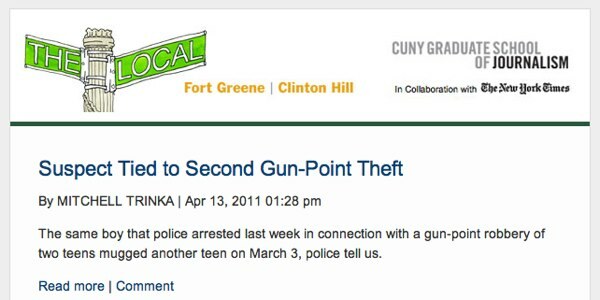 We’ve just launched an email newsletter for The Local Fort Greene-Clinton Hill. I hope to report on how it’s going as time goes on; we think it will be a useful tool for deepening engagement with the community. The idea is to go Public Insight Network-style and build up a database of The Local’s readership. Right now, this data is just stored in Wufoo but we’ll eventually set up another Highrise account for the reporters to use. Of course, all of this can be A/B tested, generates trackable data, etc. Let the experiments begin. Every morning, the headlines are sent out at 7 am. Why I didn’t think of this before, I don’t know. Wufoo is a web application for building forms that also integrates with a variety of other services. We’ve been using it as our lead generation tool on the Entrepreneurial Journalism landing page and automagically submitting entries to Highrise. MailChimp is a neat email service we’re starting to use more and more (for content like the Entrepreneurial Journalism newsletter). It offers the ability to import and update contacts from Highrise. This was our previous workflow. Now, I’ve set up Wufoo to auto-update Highrise and our MailChimp email lists every time a form is submitted. Woo-hoo for loosely joined pieces! Successfully generated a 44 recipient email list in MailChimp from contacts with a specific tag in Highrise. Email blast was sent at 11 pm and already has a 31.8% open rate and 13.6% click rate by 12:30 am. Data-driven education for the win. At CUNY, I’ve been bcc’ing support requests into Highrise for a while now. As much as possible, I try to keep the tone positive and professional. When a user is coming to you with a support request, it’s most likely a frustrating bug, issue, or problem they’ve hit with no obvious resolution. Inadvertently responding in a snarky or condescending matter usually doesn’t help the situation. After the Deadline is a service providing super-intelligent spell-, style-, and grammar-checking. It would be sweet to see a similar service offer real-time sentiment analysis on your support responses.